Welcome to Class 5 - Jaguars! This Jaguars are a Y6 class. Our Class teachers are Mrs Christie (Monday-Tuesday) and Mrs Roberts (Wednesday – Friday). Mrs Maskrey is our Teaching Assistant. 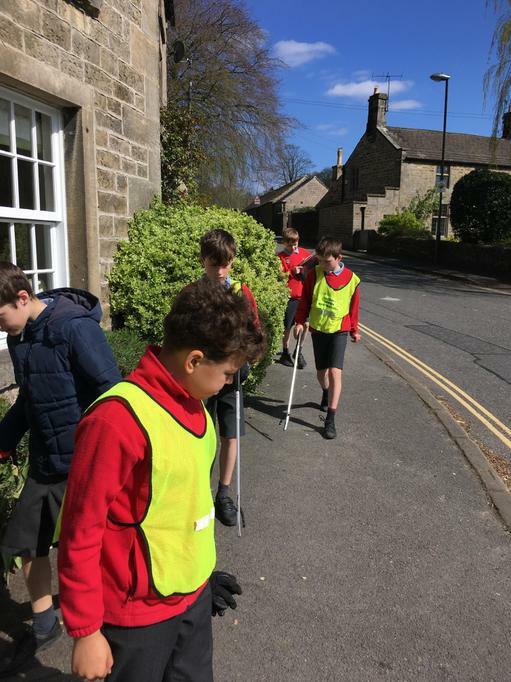 We helped to clean up Baslow by taking part in a litter pick. As a group, we picked up over 2000 pieces of rubbish. There were a high number of cigarette butts, especially along the pavement on the main road through the village. Please take your litter home or place it in a bin. Can you complete our Active April challenge? Egg Drop - We were given a list of resources and a budget. Our brief was to design and make something that would prevent an egg from cracking when dropped from 3m. we had to keep within budget and make something that the egg could be removed from and put into. Only one design was successful! Gliding Glee - We created a glider using a straw and rings of paper. We then adapted our design to create a glider that would fly further than all the others. We marked metres up the side of the hall and left the gliders where they landed to create a ‘live bar chart’. Ruler Reactions - We tested our reaction speeds! Our partners dropped a ruler and we had to pinch to stop it as quickly as possible. We repeated our test and found our average. How quickly do you think you would react? Marble Run - Each group was given the same equipment and we had to design a marble run which would keep a marble continually moving but for as long as possible. Which one do you think was the best? Mallowy Towers - We had to create the tallest structure we could using just marshmallows and spaghetti… It did NOT go well! We revisited work on food webs and food chains and played a game where we discovered what happens when environmental factors come into play with animal populations. We have been learning about evolution and played 'The Dating Game' to explore how animals compete for a mate. We had a great time learning a Zumba routine. We tested the best beak shape for different bird foods to look at how birds have adapted over time to suit their environments. During our ‘Light’ topic in Science, we made white by spinning colour spectrum wheels, split white light into the spectrum through refraction and made objects disappear by using refraction through water and also used reflection to make periscopes. We grew some disgusting mould of all shapes and colours during our work on microorganisms. During our work on the narrative poem ‘Charlotte Dymond’, we carried out a mock trial to see if we found the defendant guilty of her murder. We found the defendant… NOT GUILTY! We made wristbands to promote our class value of respect!